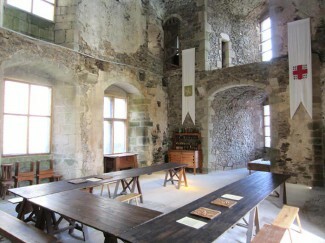 There is much to study and learn about the medieval banquet hall which was so popular in 12th century England. The great, Norman stone castles of that period all generally had what was referred to as their ‘Great Hall’ and this is what was commonly used to stage magnificent banquets to entertain the noble lord’s guests. At any given special occasion, the hall would be bustling with people all enjoying the celebration. That celebration could be a wedding, a birthday party or even in recognition of a victory in battle! Usually the banqueting hall was the biggest room in any castle or country house. With high ceilings and a grand fireplace the hall often had a minstrels gallery as well or certainly a raised area to accommodate the musicians whose fanfares heralded the arrival of the next course. The Great Hall was in many ways the centre and hub of most of the activity in a Baron or Lord’s castle. It was used not only for celebrations but also for many important ceremonies. Medieval tapestries or heraldic flags and banners would have adorned the walls proclaiming the importance of the most eminent of the assembled guests. This was particularly so if a king, member of a royal family or important member of the Church was amongst the banquet guests. Most medieval banquets saw a lot of wine consumed so being able to serve the wine and replenish guests’ goblets was very important. A special table or a cupboard known as an aumbry would be somewhere in the Great Hall and on its shelves would be ewers (wide mouthed pitchers or jugs) as well as highly decorative platters. Many of this type of banqueting hall still survive in castles around the world today. Pictured above is a good example: It is the banquetting hall at St Mesmin Castle in the Vendée area of South West France which has been lovingly and painstakingly restored so that modern day visitors can get a sense of its original splendour. When you stand in a historic place like this you begin to get a sense of what it must have been like for the lucky few nobles and their guests who enjoyed many a lavish evening’s food and entertainment there.